Why has Designs Signage Solutions joined Working Voices? 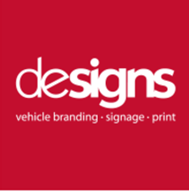 From humble beginnings back in 1993, Designs Signage Solutions has grown from sole trader status to become one of the UK’s leading signage and vehicle branding firms. Designs supply graphics, signage and vehicle livery in the UK. For 24 years, Designs have been serving clients of all sizes from small local businesses to large national firms. The company has built a strong reputation as an elite manufacturer of custom signage and lettering, vehicle livery and branding. Ultimately, the company aim to help others establish their own identities through eye-catching, professional signage and branding. Through constant investment in their staff, facilities and technology they continue to meet our clients’ expectations for quality signage and vehicle branding. Designs hold the mission to provide our clients with exceptional products, service and quality.